Kool & The Gang’s “Celebration” is spilling across USC’s three beach volleyball courts on a sunny Thursday, but Sara Hughes isn’t in a dancing mood. She’s lying on the ground with sand all over her face after unsuccessfully diving for a ball during a drill. Her coach, Anna Collier, is laughing. So is Kelly Claes, her playing partner. It’s an unusual sight at practice—a mistake met with chuckles rather than corrections. But Hughes and Claes have earned the benefit of the doubt. They each have banners at the university’s Merle Norman Stadium, an honor bestowed upon them for their All‑American achievements. Hughes and Claes won the pairs national championship as sophomores. They went 48-0 as juniors, dropping one set all season. Anything less than an undefeated senior campaign, culminating in another title, would be shocking. The moment these Orange County 20-somethings graduate later this month, they’re expected to officially go pro and garner big-time endorsement deals. April Ross and Kerri Walsh Jennings are America’s reigning beach volleyball stars. With six Olympic medals between them (three golds and a bronze for Walsh Jennings, a silver and bronze for Ross), they’re the second-ranked pair in the world and easily the best on the domestic tour. Together, they are near-locks for one of what will likely be two American spots at the 2020 Summer Olympics in Tokyo. But there’s a new duo in town—Hughes and Claes—and they have a chance to become the new faces of beach volleyball. Hughes still remembers the moment she fell in love with beach volleyball. She was 8 years old, on the north side of the pier at Huntington Beach, when Bill Lovelace—a legendary Orange County coach who died in 2015—told her that she had the best ball control for a kid her age that he had ever seen. That Claes eventually would fit Hughes’ criteria would have boggled Claes’ mind as a kid growing up in Fullerton. The only time she and her three siblings got to the beach was when their parents, both teachers, had summers off and they would all go camping. Other than frequenting Laventina’s Big Cheese Pizza in Newport Beach, Claes’ favorite O.C. pastime is going to Disneyland. She’s also a big gamer, especially when it comes to the “Legend of Zelda” series, which she plays over and over with her sister. That, plus a love of anime and cartoons, leads her to characterize herself as a “huge nerd.” Like Hughes, she visits home most weekends, but only when a parent or her boyfriend is up for driving as she has no car. That was enough to do the trick. Hughes enrolled in fall 2013. Claes, originally a grade below Hughes, graduated high school early and enrolled at USC for spring 2014. They played with other partners initially. That was temporary—Collier always imagined Hughes and Claes teaming up again in college. “I never doubted that from the first moment, because I absolutely recruited them together,” she says. The grueling 54-minute match came down to the third set, which Ross and Walsh Jennings barely pulled out, 17-15. “That was the moment I realized, ‘Wow, these two are going to be superstars,’ ” AVP Commissioner Donald Sun says. It’s not hard to see how that could extrapolate to volleyball. According to Collier, that’s just what happened—after about a year of playing together, the give and take made its way to the beach. “I remember Kelly saying, ‘I don’t even have to think about where Sara is anymore.’ When I heard that, I went, ‘We’re done. We did it. We got it. We’ve got the chemistry, we’ve got everything,’ ” Collier says. It only gets more challenging from here. Almost beating Ross and Walsh Jennings is impressive—especially for college players—but once they go pro, the expectations will change. Hughes and Claes will have help along the way, including from May-Treanor, who was a volunteer coach at USC during their freshman year. “I’ve talked to many young players, but obviously those two will have a special place in my heart,” May-Treanor says. “They want to come to me for information, so I’m willing to do that.” May-Treanor is an endless fountain of advice, considering she achieved what Hughes and Claes believe is within reach: success at the Olympics. Whether she’ll admit it or not, Hughes has long known she has a bright future in the sport, and she’s pragmatic about what’s next. She’d like to move forward with Claes, but allows for the possibility of an injury, or something else that could splinter them. Hughes wants to move to Orange County after graduating; Claes is leaning toward living at home in Fullerton with her parents for a bit. 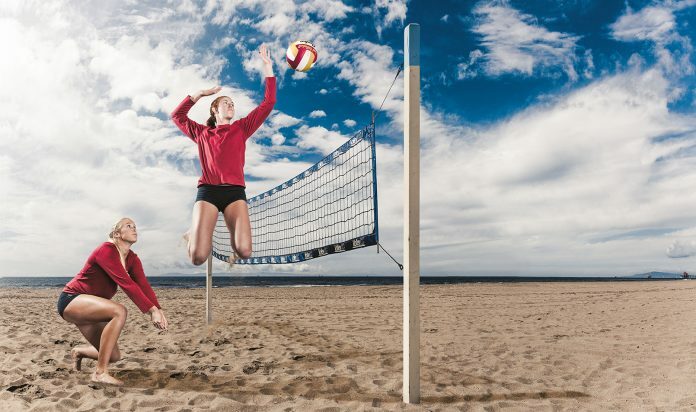 Orange County has become an incubator of world-class women’s beach volleyball talent. Hughes and Claes have a shot at becoming the best from the area—perhaps the best in the world. Though they had different volleyball upbringings, and their initial pairing was mostly circumstance, they clicked. For that alone, Collier believes they’re better off remaining a duo when their USC days come to a close this month.